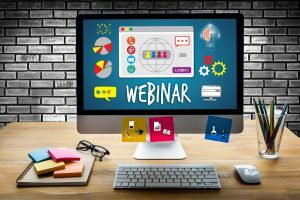 On-demand events tend to be in a webinar format - an educational, one directional presentation. While these events may lack the networking component of live (and even some live streamed) events, they are a great option for learning and training, providing just-in-time information. Today's learners are no longer content to wait for a class to learn about a topic when they have the knowledge of the world in their pocket. Think about your own life. Let's say you are interested in re-tiling your bathroom. While you may research some in-person training at a local hardware store, likely you'll take a look at YouTube videos to get a baseline understanding of supplies you'll need and techniques to use. Similarly, in the workplace, people are not committing as much detail to memory since they can call up information quickly via online databases and knowledge management systems when needed. They get smart on the topic when they need it rather than at an arbitrary time when training sessions are scheduled by HR or management. Continuous Diagnostics and Mitigation Program - This is a webinar that introduces viewers to Continuous Diagnostics and Mitigations (CDM), a program that provides government agencies automated cybersecurity capabilities oriented around prioritization to defend against today's advanced cyberthreats. It walks through the CDM program phase by phase and provides the key questions you need to consider while implementing CDM at your agency. Digital Model of Engagement - Hosted by Salesforce, this webcast discusses multi-channel digital engagement models, ensuring consistent and efficient citizen experiences anywhere, anytime, on any digital channel. FIPS Certified Containerization - Produced by Docker, this event provides an overview of the benefits containers provide for the security posture of agencies and programs. It also addresses how containerization helps satisfy FISMA and other regulatory requirements. F5 Government Technology Symposium - F5 recorded sessions from their annual live symposium and they are now available online. This year's event was themed, "Cloudy with a Chance of Breach." The event includes numerous discussions on how to prepare for different types of attacks such as securing cloud-based applications and automating security processes to further enable the migration to the cloud. IBM Government Analytics On-Demand Resource Center - This event features agencies discussing how they are using analytics to meet today's tough challenges -- shrinking budgets and resources, rising citizen expectations, managing the pace of technology -- while simultaneously preparing for the future. LinkedIn for GovCon: Social Selling - This is the only publicly available B2G course on using LinkedIn for government contractors. It covers the basics of social selling as they apply to the B2G market from setting your goals, building your profile, connection strategies, group selection, and engagement. Training Net-Centric Warriors for Operations in the Digital Battlespace -- There's never been a greater need for training and simulation tools that facilitate missions. Kimberly Burr, Lead Training Specialist, Learning Innovation Branch, Army Learning Model Section Directorate of Training, Fort Gordon, GA discusses training methodologies to meet the needs of today's digital as well as physical battlespace. This entry was posted in Event News, Gov/Mil News and tagged cybersecurity, on-demand, streaming, training, Video, webinar by Kerry Rea President of GovEvents. Bookmark the permalink.